This is just one example of an eight course taster menu that we recently created for a private catering client who had rented a Provenςal holiday villa in Saint Paul de Vence. Our Chefs work in private villas and homes between Monaco and St Tropez and catering like this is nearly always much cheaper than eating the same menu (if you can find it) in any French Riviera restaurant, plus you really can go to town with some wonderful French wines and Champagnes. Red Radish are Cannes based but happy to travel all over the French Riviera or the Var – get in touch today for a free quotation. Over the last ten years Red Radish have met some wonderful people as we have catered and delivered some fantastic food to some beautiful homes on the French Riviera. Quite simply there is not much better than having a great chef cook you up dinner whilst you relax around the pool with friends and family. Your very own bistro at home. 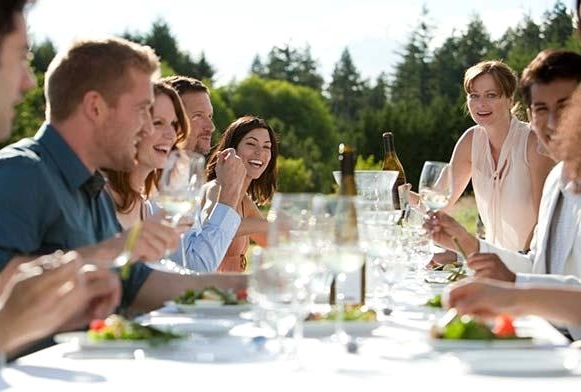 It could be catering a simple supper for just six or a large party to celebrate something specially but quite simply if you have gone to all that trouble and expense finding the perfect place then why not look for as many ways possible to enjoy it. Below is a letter we send out to clients which will hopefully give you more of an insight of what is on offer. You can also get some menu ideas here. I hope you do not mind me dropping you a line but at some stage over the last few months you contacted us regards renting our beautiful home in the South of France. It could even be that you have actually booked the villa. My reason for writing is that my partner Lucy is a chef and as well as running events and parties on the French Riviera we also do quite a lot of private villa catering during the summer. It is nice having dinner round your pool with friends or family and is usually much less expensive than going out plus you do not have to worry about babysitters, taxis and paying extortionate prices for a bottle of great wine. You can see our catering website at www.red-radish.com and we are happy to do ‘one-off’ suppers or a package during your holiday. We can also arrange delivered meals or provisioning which can be really helpful and especially great for arrival day. If you have time then you might like to read this reference which is just one of many on our website. Lastly, please do not hesitate to contact me before or during your trip if you need any help or free advice regards your visit whatsoever. We have lived here for over ten years and as well as organising events, we also work in film and TV location fixing so know pretty much everything and everyone there is to know and would be only to pleased to share our love of this wonderful region with you. Call me for a refund! “Over a period of 2 weeks on a recent visit to South of France, Wayne and Lucy catered for my party of on average 12 people, for 10 nights. Our pre agreed choices for a mixed aged party, including a number of children, were relatively basic with the prerequisite being good hearty food – Lasagne, Fish Pie, Curry, Chilli etc. I work in an industry that takes me to all the best restaurants in the world and I can honestly say that appreciating the parameters of budget, choice, timings that we imposed, Lucy and Wayne out shone even our highest expectations on each and every evening. Wayne’s perception from his undoubted experience of what people want and Lucy’s ability to deliver that view were absolutely first class. It is unsurprising they have the reputation they have or have been asked to cook for the people they have, their observed communication skill as a pair, alike every successful double act, is enviable! I would have absolutely no hesitation in recommending this couple to anybody, regardless of holiday requirement and to have 2 just totally down to earth people, without any edge between them was utterly refreshing and an enjoyable experience. “The owner of the villa that we rented for two weeks in Biot during August 2011 recommended the catering service provided by Lucy and Wayne of Red Radish. The service exceeded our expectations. We required a lunch catering service on eight days of the holiday. The menu that we requested was to be based upon healthy local produce with detail of the menu being left to the discretion of Lucy and Wayne. The excellent three course meals were served in an informal and relaxed manner which perfectly suited our small family group. Having lived and worked in the South of France for many years Lucy and Wayne were also able to provide us with local information on the best beaches, restaurants and places to visit which greatly enhanced the enjoyment of our holiday. We cooked dinner in our villa last night for 16 fantastic guests from the other side of the ‘pond’ who made the special trip over to explore the jewels of the French Riviera. They had rented the house for a week to celebrate 125 years of happiness and it sure seemed like they were having a great time as I cracked open the first of half a dozen bottles of Veuve Clicquot. I can’t quite recall the maths but there were a couple of big birthdays and an anniversary in there somewhere, so all in all it was a great cause for celebration and they probably near on covered the cost of dinner with what they saved on buying that kind of champers in a fancy resto! The menu included some great canapes which included a couple of garlic spiked Brie roasted in the oven. The starter was a glorious pink filet of salmon on a bed of crushed peas all sat on top of a balsamic glaze whilst they finished off with a the main course ofthat great French favourite, Coq au Vin along with some lovely salty crusted potatoes and stuffed courgettes. We left them tucking into the great big chocolate cake that we made for the celebration. The only pain was that yet again we forgot to take any photos!